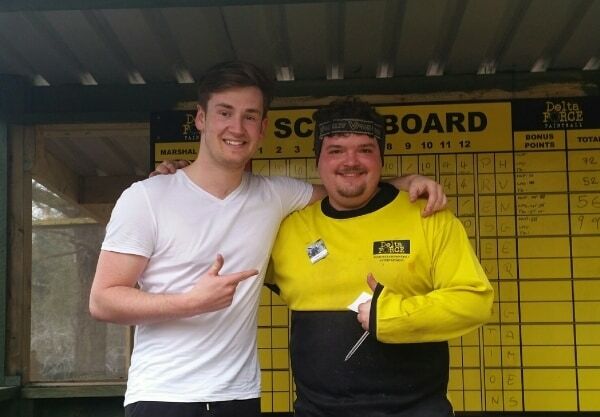 Earlier this month YouTube sensation Oli White (of OliWhiteVlogs fame) chose Delta Force Paintball for an adrenaline-fuelled day of paintballing fun. With little brother James (celebrating his 12th birthday) and friends in tow, Oli took to the battlefield at our five-star* Luton Paintball Centre, but not before he was decked out in full protection head gear, body armour, some questionably short camouflage trousers and, of course, his trusty camera. With optional grenades and M16 Paintball gun in hand, Oli certainly looked the part as he defended a Soviet bunker in our Enemy at the Gates game zone, before taking control of a Wild West village and tactically making his way through Chemical Alley to gain control of the depot. Clearly impressed with his efforts, the Delta Force marshals awarded Oli with a certificate and a packet of Fruit Pastilles at the end of the day. What more does a man need? Centre manager Pawel Sipak asked Oli for his thoughts on the victory. “It means a lot”, beamed Oli. Want to see Oli White in action at the Luton Paintball Centre? Whether you’re booking a kids birthday party, organising a paintball stag do or searching for hen party ideas, Delta Force is the UK’s Number 1 for Paintball Sports. With a five-star, first class safety record as awarded by the *UKPBA – the largest paintball governing body in the UK – you can rest assured your group will be in safe hands. Do you think you could do better than Oli? Why not get in touch on 0203 869 9301 and speak to a friendly event coordinator 24/7? Or alternatively visit the booking page to request a call back.